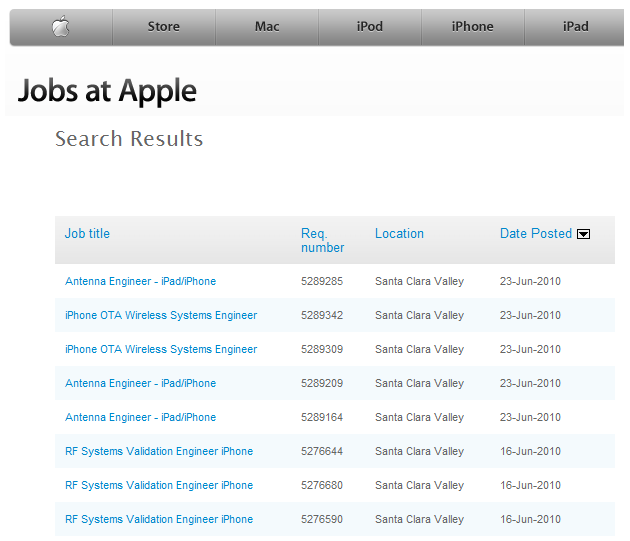 Apple recently posted job openings for not one, not two but eight Antenna Engineers, according to its website. Some of those engineers would be working on the antenna system architecture of the iPhone and iPad, according to the job postings, in order to “optimize the radiation performance for wireless portable devices”. Still according to the postings, candidates will be expected to “performance (sic) radiation performance measurements, create test plans, execute them, publish test reports, provide feedback to the other design engineers, and lead some of the manufacturing of antenna”. You’d need 10+ years of experience and possess “strong problem solving skills and strong working knowledge of radiation performance” if you want the job. In addition, Apple is looking for two people to fill the role of ‘iPhone OTA Wireless Systems Engineer’, who would be “validating the radiation performance of wireless portable devices” and three people to serve as ‘RF Systems Validation Engineer iPhone’. Update: Engadget also got tipped about (some of) the job postings. It’s hard not to see the job postings in relation to the recent antenna / reception problems with the new iPhone, which are plaguing a subset of owners. Conspiracy theorists will even point out that some of the jobs were posted on the exact same day Gizmodo and others starting reporting that users were having reception issues when holding the iPhone 4 in a certain way (June 23). Which makes it possible Apple posted the engineering jobs after seeing media reports on the hardware design flaws, but it would’t explain why the other 3 antenna-related positions were posted on June 16. Food for speculation abound, but I’m skeptic. Just yesterday, Boy Genius Report published Apple’s internal iPhone 4 antenna troubleshooting procedures it had obtained from a source. The documents show that the company is keen on continuing to say there is absolutely nothing wrong with the antenna. If anything, these job postings may suggest they’re effectively aware of the issues at hand and that they need fixing – or they want to make really sure the iPhone 5 can’t be held “the wrong way” anymore.